Four cadets and Maj. Larry McClarey took part in the fifth annual event, organized with the help of MMA alumnus Paul Barum '62, on Oct. 26. On Friday, Oct. 26, four cadets and Maj. Larry McClarey attended the fifth annual U.S. Grant Symposium, presented by the Missouri Humanities Council and the U.S. Grant Trail, held at Prairie View Church on the grounds of Graceland Mansion in Mexico, Missouri. The cadets, Liam Holland, Garry Siccardi, Richard Choy and Shama Lurie, listened to presentations ranging from U.S. Grant's experiences in Missouri to the history of the United States Colored Troops in the Civil War. Cadets were chosen to attend based on interest, deportment and grades. The symposium was organized by the Audrain County Historical Society. 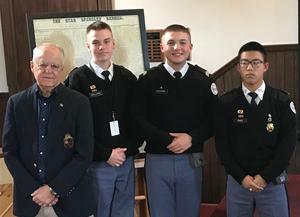 From left: Former Spanish instructor and symposium organizer Mr. Paul Baum '62, Cadet Liam Holland, Cadet Garry Siccardi and Cadet Richard Choy. Not pictured is Cadet Shama Lurie, who attended the morning session but missed the afternoon session due to Friday's football game.